WASHINGTON — Five-door hatchback compacts seem to be making a comeback as an alternative to the compact sedan or the even more popular crossover. The Elantra GT has two models: The base, which I drove, that starts around $21,000, or a sport version with a peppy turbo engine that starts around $24,000. The Elantra GT gives you space and offers that space in an easier-to-drive package. Since it’s a car, the lower center of gravity makes for better handling with less lean in turns. The ride might be a tiny bit more firm than the sedan version of the Elantra, but it is never jarring or unpleasant — just more of a tighter European feel. Fuel economy is good for the base Elantra GT, hitting 28.2 mpg for my week of driving. Power is adequate at 161 horsepower and moves the Hyundai well in the city, but less so when merging with quicker traffic. The Elantra GT Sport model offers 201 horsepower for those who need more power and better miles per gallon. There is also a choice of two different transmissions with the Elantra GT: a manual or a smooth-operating automatic. 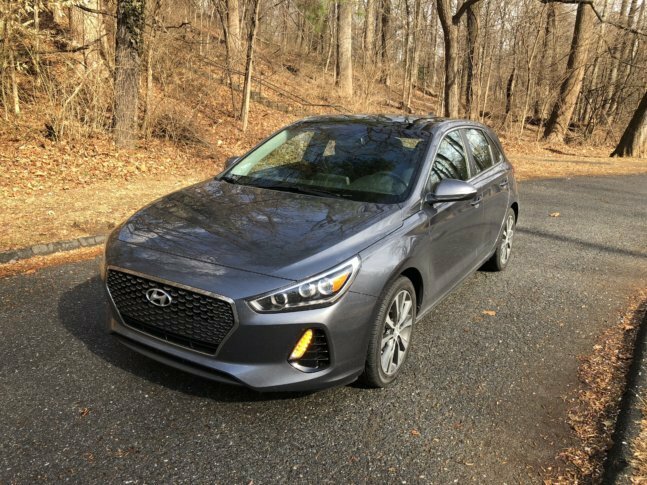 The five-door hatchback version of the Elantra adds utility to this compact, making it comparable to a small crossover size inside. The interior is a pleasant place to spend time and more so with another $5,000 in options. My car came with the $4,300 tech package that adds leather and ventilation to the seats, and they proved comfortable. Back seats have good leg room, but the headroom isn’t great with the optional panoramic sunroof. Taller riders better stick to the front seat. The cargo area is good for this class, and folding down the back seat gives you more room for large items, though I wish for an even rear floor to folded rear seat. An easy-to-use, large, 8-inch touch-screen, with navigation that has voice recognition, worked the first time. Android Auto and Apple CarPlay is standard, and my car had the optional wireless charging. Styling for the Elantra GT is more aggressive for Hyundai and even more so than the conservatively styled sedan version. The front end is a big grill, and cool LED light clusters add a sporty flair. Stylish 17-inch wheels fit nicely in the flared fenders of the Elantra GT. There is also a more sculpted body with nice lines for a compact hatch. The back end has a blacked out rear spoiler that adds a bit of sport to the GT. Usually, the rear end styling is bland, but the Elantra GT has some interesting shapes, especially below the rear hatch. The only thing missing is rear-tinted windows that would work better with the Summit Gray paint. The Hyundai Elantra GT is a surprising, small five-door hatch that’s roomy and pleasing to drive. With a long warranty and good value for your money, the Elantra GT is a worthy alternative for the buyer who wants the crossover utility without the extra weight and higher prices.